Adrian Peterson is back. Yes, I said it. The man who dominated the NFL from 2007-2015 on the ground is now officially back. Although he is 32 years old and one year removed from a three-game season, you and everybody in the fantasy world has every reason to trust him. The No. 7 pick of the 2007 NFL draft has had whirlwind of the last four seasons, including this one. He was suspended in 2014 for controversial treatment of his son, which led to a grand total of one game played for the season. 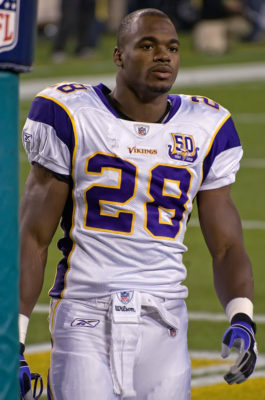 While it appeared that Peterson was going to feel the wrath of the NFL and suffer physically after he was forced to sit out for such a long period of time, he returned in 2015 with a 1,485 yard season and 11 touchdowns. Not bad. But alas, the man who was running with a desire to make up for a lost season tore his meniscus last year in 2016 just three games into the season. However, the last time he did damage to his knee in 2011 (a torn ACL and MCL), he returned with a pretty good season in 2012. Oh wait, actually one of the best seasons in NFL history by a running back. Peterson came into 2012 with a vengeance tallying 2,097 rushing yards and 12 rushing touchdowns en route to an obvious MVP season and Minnesota Vikings playoff appearance. Fast forward to the present day where he is coming off another knee injury, but began the season in a totally different situation. After being signed to the New Orleans Saints in the offseason, he was not viewed as “the guy” like he was in Minnesota. All of a sudden, he was playing second, if not third fiddle to Mark Ingram and a personal favorite of mine Alvin Kamara. While Ingram and Kamara have proved to be very reliable in their own right this season, the blatant disrespect and lack of carries for Peterson signaled a much-needed change. After logging just 27 carries in four games for a measly 81 yards and zero scores, a trade was imminent. And voilà! Bruce Arians and the Arizona Cardinals pulled the trigger to replace a prehistoric Chris Johnson and injured top running back David Johnson. The move made total and complete sense, but it did not automatically signal a clear uptick in fantasy points given the offensive line in Arizona. But one thing was and is for certain, it’s better than the situation in New Orleans. As someone who drafted Peterson, I was extremely disappointed with his performance and usage with the Saints, but now I am all in on the future Hall of Famer. His 26 carries, 134 yards and two touchdowns against a somewhat stout defensive line in Tampa Bay not only solidify him as legit RB2, but a guy who next week has almost obvious RB1 potential against the Los Angeles Rams who allow the most points to RBs in the league. AP’s one-cut ability and tackle shedding was on full display and with him logging a 1-yard score, we now know he is the guy at the goal line. Who knows when Johnson will be back? Put down everything you’re doing and go get AP. He’s back. Peterson will also benefit from not being the main offensive weapon. In Arizona he will not held to the same standard as he was in Minnesota. Let’s face it, minus one good season from Brett Favre, Peterson was the Viking’s offense. In Favre’s 2009 season, Peterson still put up monster numbers. He rushed over 1,300 yards for and scored 18 touchdowns. He also had a career high 436 yards receiving. Defensive coordinators will have to plan to stop him as well as Larry Fitzgerald, John Brown and Carson Palmer. After a virtual year off from AP, I suspect he will have a strong season.